Have you ever wondered why you can’t keep up a new year’s resolution? The reason is, it’s not a habit. In order to keep up to a resolution you need to make it a habit. Just like how you have made a habit of brushing your teeth every morning. To make it a habit you need to create your list of resolutions well in advance and start practicing it well before the new year. 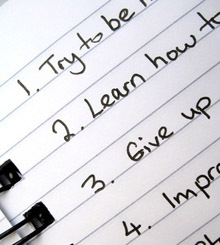 My new year resolutions were ready in the first week of November 2013 and I am already trying to cultivate it as a habit. The advantage of this method is that even if you miss a day or two it doesn’t really matter. You can start over again because deep inside you know that the actual commitment to the resolution starts from January. If you start now you can definitely have the habit cultivated by January and continue it along throughout your year. So just pick a pen and paper and start writing down your new year resolutions… NOW !!! Did you like this post? Post your feedback in the comment section below. I would love to here from you.